Featuring the Womens Royal Dark Queen Costume in a polyester black velvet gown, off the shoulder cap sleeves, fitted silver lined embodied corset top and flowy attached open cape. 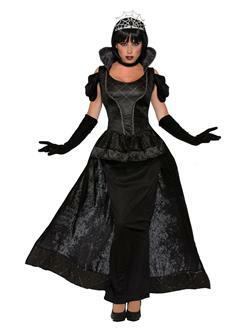 This gown is great whether it is for Halloween, cosplay, costume party or a formal ball. You will be a shadow of royalty and darkness! So, place your order today and watch them feast at your appeal and terror.